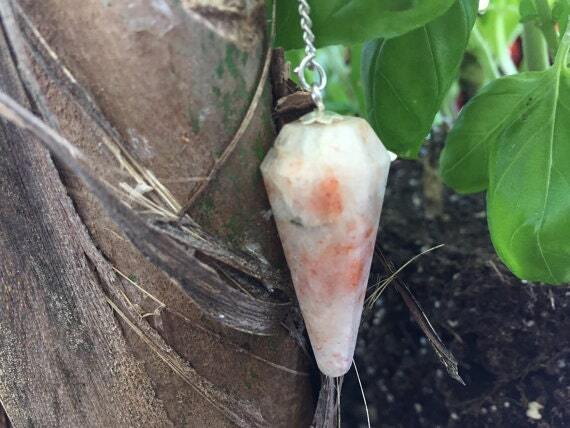 Sunstone Crystal Pendulum Perfect for chakra balancing, meditation, energy healing and much more. You will receive the same pendulum seen in the picture. SIZE:Pendulums are 6-sided with a silver chain that has a tumbled clear quartz nugget or clear quartz bead at the end. The pendulums measure about 7" long with the gemstone itself measuring approximately 1.5" long. Sunstone is a joyful stone. It restores life's sweetness and helps you to value and nurture yourself. It can lift dark moods and is said to be beneficial for Seasonal Affective Disorder. It encourages optimism and enthusiasm and helps overcome procrastination, helping you take action to live your life as you'd like to now.